Why Complete Your Graduate Degree at Stan State? While obtaining a graduate degree is often a crucial and fulfilling step towards career advancement, it can also be a difficult endeavor. For this reason, it is paramount to make your graduate education worth your investment. The Princeton Review has consistently named Stanislaus State as one of the best colleges in the nation. We offer graduate programs that appeal to a variety of schedules, including a hybrid Master of Social Work program, and a fully-online MBA program. We also maintain a friendly and “small campus” feel while providing many of the amenities of a larger campus. Our graduate students have the ability to engage in an advanced, scholarly degree program that will equip them with the knowledge needed to succeed in their prospective careers. 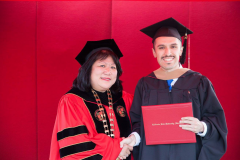 Immediately after graduating with his Bachelors of Science in Business Administration, Luis Urbano knew that he wanted to continue his education one step further. Fast foward a few years, Luis now works in digital marketing for a manufacturing company and is enjoying every minute of it. We invite you to explore the opportunities that await you as a Stanislaus State graduate student. Choose one of the links below to learn about program requirements and important dates and deadlines. More questions? Give us a call  or email Graduate_School@csustan.edu . To ensure the quality of the advanced programs and student learning experiences, the Graduate Council established six student learning goals for graduate/postbaccalaureate students in master's and doctoral degree programs. Students will demonstrate advanced knowledge, skills, and values appropriate to the discipline. Students will demonstrate the ability to be creative, analytical, and critical thinkers within the scope of the discipline. Students will demonstrate the ability to contribute to the scholarship of their disciplines. Students will demonstrate relevant knowledge of diverse perspectives and broader contexts as appropriate to the discipline. Students will demonstrate knowledge of new and various methods and applications as appropriate to the discipline. Students will be required to demonstrate advanced communication skills, complemented, as appropriate to the discipline, by the ability to access and analyze information from myriad primary, print, and technological sources. The Graduate Council continually assesses the achievement of these goals using surveys, program reviews, and analyses of student academic performance.